Are you not yet a PortaSigma user? 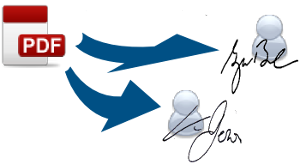 Save time saving your usual digital signature requests on templates! Many of your customers already have a digital certificate. Offer them the possibility to sign authorizations, requests and contracts online. It is completely legal! Would you like your contacts to send you documents to sign through PortaSigma? Let them know!